I've had an idea (having recently gone and poked around the trivia section) to do a trivia for the armoury. The quiz, or part of it, should be in your PMs. 10 question quiz. I figure I could suggest ranks for correct answers. 0-2:Corpse: Oh dear. I fear we shouldn't have let you handle weapons in the first place. It's too late for that though! 3-5: Novice: You still have a long way to go before you can stop practicing with wooden wasters and test true steel. Try not to cut yourself! Best find a quiet order, like the White Knights. They train healers and monks as well, so I hear. 6-9: Knight: You have proven yourself worthy of knighthood with a cool head for weapon lore. Stand proud! The Knights of the Fallen would be glad to have one of your knowledge at their side. 10: Champion: Arise, Child of Armeros! Your battle lore and knowledge of weapons is second to none! 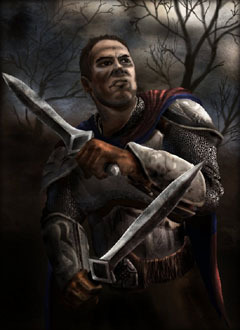 Perhaps you may ahve the skill to succeed at the Armerenda, like the legendary hero Jaecor Armerson. Good to have weapons covered as well in a quiz now. I see there are also a bunch of pictures we can use now to go with it, that's always a plus if we have the illustrations right at hand. Makes it much more fun to have an a correct answer rewarded with an illustration, or even see a picture if you chose the wrong answer. So this looks good. It will last quite a while till I can integrate it all, though, because I now have to use my spare time to make progress on Nepris II, but I'll get to it, don't worry! Aura +1 at any rate! My overall entry progress may be slowed by school stuff (hence the crunch now) but I imagine I could turn out a quiz or two in my spare time. There's a lot less work. You've got 6 months, Mister, or you lose it. I like your categories and descriptions, Valan! Good choices of pictures, too! There's only one thing I would say: with ten questions and (I assume) four choices each, a person who knows nothing and guesses answers randomly has an almost 50% chance of getting three or more points (47.4 %, actually). So personally, I would widen the range of the 'corpse' category (maybe from 0-4? ), and adjust the other ranges accordingly. I don't see the quiz on Santhworld yet, but I'm looking forward to taking it. Given my knowledge on weapons, I have a good chance of ending up as a 'corpse', whatever points range you settle on. Ok, guys, Valan's new Armoury Quiz is now on site! Access it through Santhworld, START TRIVIA, MISC, second option. - The ranks were adjusted according to Shabakuk's proposal. - The answer your provided at the swords/tribes question wasn't correct... Fixed that! a) Try to also find possible pictures to go with the ranks you've made up. b) Also don't just provide questions and answers A, B, C or D. Rather add some text explaining something, like why your answer is correct. Or if you chose a wrong answer why it is not the right one. The point of quizzes is also that the people doing it actually learn a bit of Santharia. If they think they've chosen the right answer, and it isn't, it helps to give them pointers where they went wrong. I've done all the mentioned things now at this quiz, hope you enjoy! Ten out of ten. Art, I had suggested pictures, the links alongside the proposed rankings were intended to be used. I'll make sure to get that other bit the next time I make a quiz. mMaybe an Artifacts quiz. @Judy: A dwarf module for the North perhaps? Dwarves digging into the Netherworlds? @Valan: A-ha! Now I see the links, sorry! I copied the text into wordpad where I collect everything I prepare, and of course while copying the links didn't come through... I hope the choices I made are fitting - the Knight of the Fallen pic I used in the quiz BTW, so it better shouldn't have been used twice then anyway. Only a few lucky guesses prevented me from ending up as a corpse - I got 6 out of 10 points and am now a proud novice. Nice little quiz. Aura for Valan and Art! Edit - PS: I did like Valan's picture selection for 'novice', though! Good quiz! I scored in the Novice range as well.